This was our only day off, and most people rented cars to drive either to Boston or Provincetown. 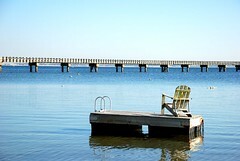 I chose to head to Provincetown with two of my teammates and two others from the Sydney office. Here we are having a lovely seafood lunch. 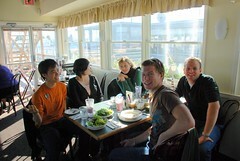 The shot was snapped by Ren Hua, who was seated with others from the New York office at the next table. Since I last wrote around National Day, I have been on what feels like dozens of planes, clocked hundreds of hours of work, written thousands of lines of Excel as well as personal emails and somewhat settled into what might be viewed as an unexpected life choice for me. To recap: Towards the end of my internship I was extended a job offer and after about a week of consideration I decided to take it. I started immediately, against everyone’s advice urging me to take a vacation first. So I’m now an Ass0ciate ConsuItant in Singapore with Ba1n & C0 [apologies for the odd typing, I’m trying to fend off the spiders]. In many ways the job meets the profile of what I’d wanted to do right out of college if I had to have a real job – it’s interesting, dynamic, hectic, and has some pretty great perks. The expected downside, that I haven’t had time to maintain connections to the people, events and activities I used to (like this blog), hasn’t been too much of an inconvenience so far, and I think as time goes by I’ll adjust to the schedule and reclaim more me-time. Highlight: A couple of months back Flora was lovely enough to entrust me with the weighty privilege of being the official photographer at her solemnization ceremony! It was great fun, if a little anxiety-causing since I really wanted to give her and Alfred the best images I could of their beautiful, intimate event. One of the (many) perks of the job is the training sessions we get sent on around the world every couple of years. First year juniors like me get sent to Cape Cod, so I got to visit my old haunts in Cambridge and Boston back in October which was lovely. I saw some Dins, some roommates, some dear friends… I got to tie up some loose ends and revive some old connections. And the training itself was great fun, especially because the trainers and other newbies were lovely people. And while I was there I got some white silkie eggs! At the Boston Poultry show, no less!! 🙂 They’re currently a week from being due to hatch in my spiffy new auto-turning, state-of-the-art incubator that’s right here in my room. So exciting! I haven’t figured out how I’m going to deal with the first couple of months until they become old enough to wear diapers, but I’ll figure something out along the way, I guess. My main concern now is finding some chick starter feed next week… where should I look?? This is the first free weekend I’ve had in over a month, and it’s sad that none of the people I sent messages to are free this weekend. Meanwhile, half the young’uns in the office are in Bangkok attending a colleague’s wedding. I’d tried my best to go but couldn’t get tickets in time. Hopefully next week’s trip to Hong Kong will be better fated. Maybe I’ll post some pictures up next time. PS: Is anyone even continuing to read this blog, after a three month hiatus? ?